Father's Day is fast approaching so it's time to plan a meal that's fit for a Dad. The folks at Double R Ranch sent me one of their Cowboy Chops to try and I wanted to find a way to do something special while not compromising the natural beauty of this fine cut of beef. After a little thought I decided that a simplified and more manly version of my Steak au Poivre would do nicely. 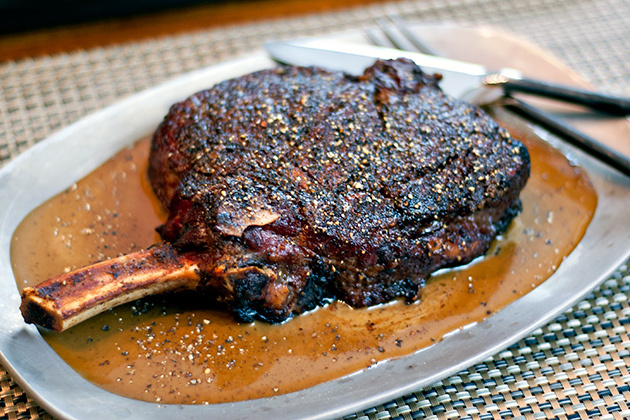 Some of you may be asking yourself (as I did), "Self, what exactly is a cowboy chop?" Well, the short answer is, it's incredibly delicious, but the longer answer is that it's a USDA Prime bone-in ribeye with a Frenched bone (handle). The ribeye is hands-down my favorite cut of beef, and I must say that this steak was easily one of the best steaks that I've ever eaten. 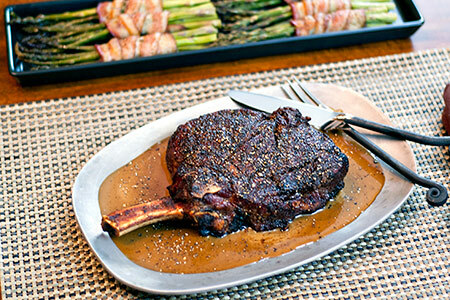 While this is one steak, at just over two pounds it's plenty for two people, or for one big Dad. Head over to the Double R Ranch Facebook page and enter for a chance to win one of these incredible steaks and two limited-edition stainless steel flasks. Before we dive into the recipe let me describe my approach to grilling this beauty. You may have heard of the concept of a "reverse-sear". If not, you can read all about it (with some commentary from yours truly) at my friend Meathead Goldwyn's incredibly popular BBQ and grilling site AmazingRibs.com. In short, the idea is that you cook large cuts indirectly to just below your desired doneness and then blast it for the final few minutes over direct heat to sear the outside. This gives you that beautifully mahogany crust on the outside and perfect edge-to-edge doneness on the inside. When done properly this method yields perfect steaks every time, as it did in this case. Note: I know that the recipe calls for what appears to be an insane amount of black pepper, but just go with it, sit back and be amazed. Season all sides of the steak with about two teaspoons of salt. Lightly oil all sides of the steak and coat each side and the edges with as much of the pepper as will adhere. Let the steak sit at room temperature for about 30 minutes. Grill the steak indirect until the internal temperature is about 15º below your desired final doneness (about 30 minutes for a final medium-rare), flipping once at the halfway point. Once grill has reached high heat add the steaks. Sear each side of the steak until it is browned nicely. Stay close to the grill and flip the steak every minute or two to ensure even searing. When the steak has reached five degrees below your desired finished temperature, remove it from the grill onto a platter, tent loosely with foil and let rest. While the steak is resting, make the sauce. Heat a medium sauce pan over medium heat, add the bourbon and very carefully set it alight to burn off the alcohol. Warning: The blue alcohol flames can rise up to 18 or more inches from the top of the pan, so ensure that you have adequate clearance above the pan. When the blue flames have subsided, add the cream, Worcestershire sauce and beef base to the pan, bring to a simmer while whisking well, then reduce to low and cook two minutes, whisking occasionally. Remove the steak from the platter, add the released juices to the sauce and whisk well and remove from the heat. Pour the sauce into the platter, slice the steak on a bias (diagonal) at about 1/4", place the slices in the sauce on the platter. Or, you can do what I did and serve it whole. Serve and enjoy! I dusted mine with a little more freshly ground pepper. Disclaimer: I am a partner of Double R Ranch and I was compensated for this post, but the thoughts and feelings expressed here are completely my own. That looks delish. I love grilled asparagus. I could eat every one that's in that dish. Looks great! I'm going to fire one of these up for Father's Day! What an amazing life! Being compensated for eating an amazing steak!! I love flambes, especially when I manage to do it and keep all of my eyebrows. Fantastic looking steak, John. You nailed it. That looks amazing! Steak and pepper are two of my favorites and then add a sauce of honey bourbon, cream and worcestershire - brilliant. Mind if I add your recipe to our google+ facebook pages and link to you? Real Man Gifts - Thanks for the kind words. Feel free to share the recipe, with attribution. I've visited the facebook page you mentioned in here. Love the cover photo. =) Very enticing. Hope that I could get the chance to have a taste of Cowboy Chop au Poivre. Perfect bbq recipe for summer!